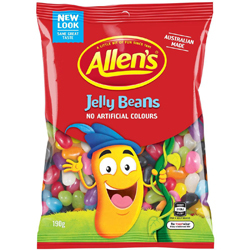 Coming in a wide variety of colours and flavours (raspberry, apple, orange, strawberry, aniseed, apricot, vanilla, blackcurrant and blueberry) these goofy Jelly beans are great fun and can be enjoyed by everyone being 99% fat free. Which one or combination of flavours will be your favourite? Cane Sugar, Glucose Syrup (Wheat or Corn), Thickener (Dextrin Roasted Starch, Acid treated Starch or Starch acetate) (Wheat), Invert Syrup, Colours (Spirulina, Carotene, Carminic Acid, Vegetable Carbon, Copper Chlorophylin, Turmeric), Flavours, Gum Acacia, Food Acid (Citric).